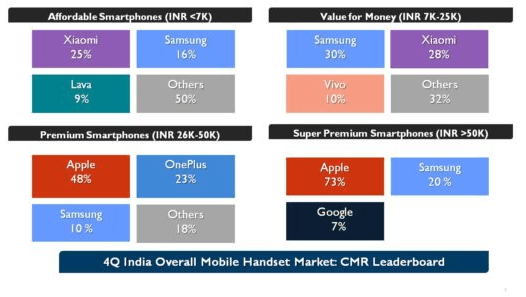 According to CMR’s India Monthly Mobile Handset Market Review Report released today, mobile handset vendors shipped 88 million mobile handset units in Q4 2017. For the entire year, mobile handset vendors have shipped around 287 million mobile handset units in India. The smartphone market recorded a 19% sequential decline during the quarter, with 30 million units shipped. The feature phone market, on the other hand, witnessed a 36% sequential growth in Q4 2017, and YoY growth of 62%. With the help of Reliance JioPhone, Reliance Retail became the top feature phone brand with 27% market share, and Xiaomi registered an impeccable growth of 317% to became leading smartphone brand in the country with 25% market share. In the last quarter alone, brand shipped close to 88 million mobile handsets which is a record-breaking number. CMR also stated that 2017 witnessed the emergence of a new promising breed of handset brands, including Comio, NUU Mobile and 10.or (Tenor). And the same time, the research firm stated that 2017 saw alarm bells ringing for handset brands, including HTC, Asus, Intex and Gionee. HTC registered a decline of 79%, followed by Asus with 66%. 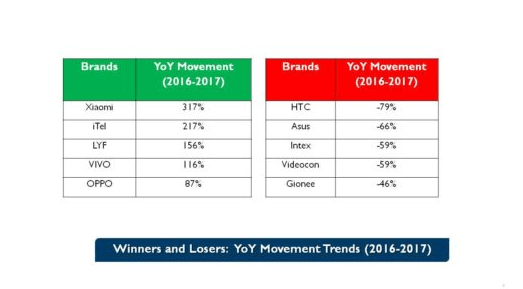 And the surprising name here is Gionee which saw a decline of 46% during the year. 2018 will be a challenging year for those brands who struggled in 2017. Speaking about the Q4 technology insights, overall 4G handset market grew by 19%. 4G smartphones declined by 17%, while 4G feature phones grew 546%. 2G feature phones grew by 5%. 3G smartphones declined by 71% on a small base. And the share of 5-inch to 5.5-inch display smartphones increased to 71%, while dual camera smartphones grew by 48%. 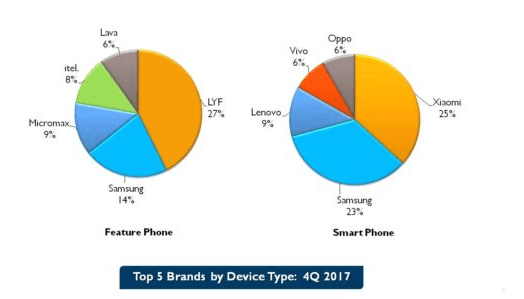 Overall, Samsung remained market leader with 21% market share including both of feature phones and smartphones, followed by itel Mobiles, and Xiaomi with 9% market share each. Jiophone becomes sluggish and laggy after initial usage. Brightness settings do not remain fixed. And above all, font size is too tiny and are is not adjustable. OEM charging cable is too short. Sir, it’s a feature phone for God’s sake!!! Jio phone isn’t built to handle ton of web browsing, multi media consumption etc. The target users will most likely use with ?49 plan per month with occasional browsing & rarely with heavy consumption. It’s not an ideal phone for gaining a good user experience as compared to a decent smartphone!